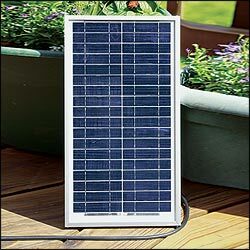 This well made solar panel has an anodized aluminum frame with mounting holes and a glass front for clarity. Included is a cigarette lighter plug on the end of a 6' lead wire. Current at peak power: 10 watts @ 17.3 volts. Weight: 3.7 lbs. Size: 9.8" W x 17.5" H x 1.3" D.